Magnification range from 0.1x to 2x. Easily alter the magnification ratio without installing an extension tube or teleconverter. Ideally suited for rapidly changing macro photography scenarios. Houses 9 elements in 7 groups in a patented optical structure to provide a great deal of image clarity and accurate color. The optical system consists of 2 major moving lenses groups in order to minimize barrel distortion. 14 aperture blades form a close-to-circular aperture, capable of creating creamy bokeh. Canon EF, Nikon F, Sony Alpha and Pentax K mount are available. Sharpness! You don't need a lot of space to work with. Perfect for slow moving or still objects! 2:1 magnification, which is amazingly usefull. Not ideal for portraits (but why would you) No autofocus, sometimes good for fast little critters. Quite close focusing distance, because of the flight distance of some animals. 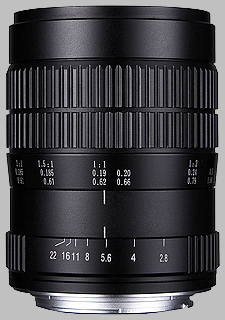 This Lens is an absolute must have for macro fotographers. If you are getting used to it focusing manually, which you have to on macro photography anyways, then this lens will get you some pretty astonishing results. For me it works perfectly on a mirrorless camera. Because of the Focus peaking and the speed of the camera it is way more easy to get the little things in focus. But it is not easy at all. Even on f/8, which i use for little Insects like Ants. Its metal construction is solid built. The aperture ring is nice and clicky. The Focusing ring has the resistance it needs but it is nice ans smooth. The only negative side on the build quality is that the lans has to be cleaned and maintained once in a while. More often than a "regular" lens. You can feel that the focusing ring begin to move harder after a few months of regular usage. And you can compare the sharpness to the Canon 100mm F2.8 Macro L. Yes, it is that good! All in all, for me as an macro photographer, this lens is absolutely worth its weight in gold.